Robots and Older Adults: Prevalence of Ageism. Time flies when there's so much to do, and it's been awhile since my last post! I have been researching articles for my paper, and slogging away through the initial draft process. It's been a challenging experience, but I've been learning so much! Although there are many articles in the area of assistive robots, they are either focused on technical aspects, or emphasize views of designers, technologists, and other parties who are not the intended end-users. I'm not suggesting that their views are unimportant, yet I think it's perplexing that the most relevant persons, namely older adults, have played only a minor part in the conceptualization and testing of products. Then, I read a few mind-opening articles: one written by Peine, Rollwagen, and Neven (2014), and the other written by Neven (2010). 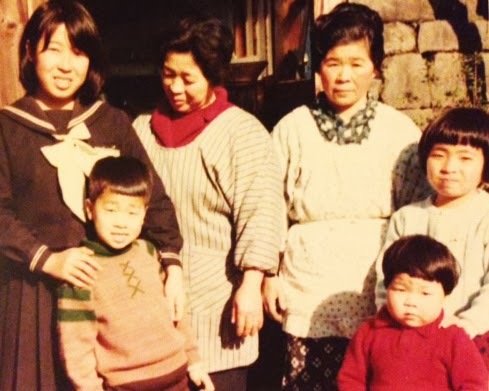 Me, as a chubby-cheeked 3-year old, posing with relatives. Peine et al. wrote about how stereotypical assumptions of older adults leads researchers and designers to create products that lack meaningfulness, thereby overpowering older adults' potential to be co-producers in creating innovative products. Moreover, Peine et al. call critical attention to the paternalistic view in gerontechnology where older adults are expected to be the passive recipients of products. Likewise, Neven found that older participants in robot user-studies saw themselves as test users, rather than old people that such products were designed for. Many in Neven's study viewed themselves as healthy and active, thus they felt they were assisting research to help others who were weak and socially isolated. The authors in both articles point to the negative ways of how assistive products are positioned -- as aides for older persons who need help due to age-related declines, rather than as useful devices for individuals who wish to enhance their independence. These articles really made me think. If I were the intended recipient of such products, I would be offended by the ageist views that are assumed as fact concerning older persons, such as being tech-averse, ignorant, or slow and decrepit. It makes me understand one reason (out of many) for the discrepancy between the availability of robotics products and the lack of older users. There's still more I can say about this issue, but I have to get back to writing my draft! Thank you, as always, for visiting. I hope to post again within a few weeks, but please feel free to comment.